You’ve had a long and successful career in leadership. What is the secret to your continued success? In this business, that’s one of the challenges, you’re in the spotlight as an administrator. You really have to be cut out for it. You’re not always going to be the most loved person in the world and you’ve got to take your victories one day at a time. My approach to all these positions is collaboration and cooperation. As a very public facing government official, it’s so helpful to have an association like AAMVA that allows you to reach beyond the borders of your state or your jurisdiction to share ideas, to sometimes commiserate about the common challenges we all face. When I was commissioner in New York and in New Jersey, I freely borrowed ideas from other jurisdictions because they were offered up. And that’s one of the great things about the AAMVA community, people share. 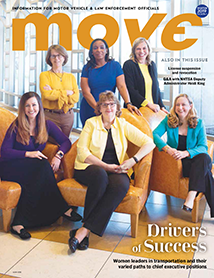 We talk about being the face of state government at motor vehicles, it really is. It’s unlike any other department at the state level, and I consider FMCSA the DMV of the USDOT. That’s a compliment. What are your current goals for the FMCSA? The name of our agency says it all. We’re not the Federal Motor Carrier Administration, we’re the Federal Motor Carrier Safety Administration. Congress did not make a mistake in naming it. Safety always has to be the priority, and trying to reduce or eliminate crashes involving large commercial motor vehicles. We wake up every morning with the same goal, let’s see what we can do to improve safety. And it’s a challenge because as the economy grows and does well, that increases commercial motor vehicle traffic on the roadways. If you follow the math, more miles traveled often, unfortunately, means more crashes, fatalities and injuries. When a commercial vehicle is involved in a crash with a passenger vehicle, there is a high likelihood of fatality because of the physics. So we’re always focused on safety. But we have to balance that with the role the commercial motor vehicles play in our national economy. We are central to commerce. And especially in this day and age where we order something in the morning and we want it on our doorstep in the afternoon, somewhere along the line a truck is involved in getting those goods to you. 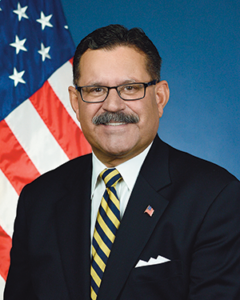 Here at FMCSA, we have to work very closely with the regulated community. I go to a lot of conferences, I talk to large carriers, small carriers, owner-operators, truck drivers, there are a lot of different opinions out there, but you have to listen to them all and try to make sense. And you want the agency’s regulations to make sense to them. That adds credibility to our agency. I really do believe that the vast majority of truck drivers and carriers are concerned about safety, they want to get home just like all of us, and they want to be safe on the road. And yet, crashes happen. So we all have to work together to reduce them. Another thing we’re looking at is hours of service. The trucking industry has been regulated since the 1930s with very stringent rules for how many hours you can drive, when you have to take breaks, and things like that. We recently fully implemented, per Congressional mandate, electronic logging devices that replace the paper logs truck drivers used to keep. We’re still in a transitional phase on that, and it has put some stress on the trucking industry. From our perspective, ELDs, electronic logging devices, is a very good improvement, it will provide safety over time because it keeps everyone honest. They prevent changing the logbooks. But it takes time for both the regulated community and law enforcement to get used to the technology, the rules that apply, the laws, regulations and guidance. Mine has not been a career that your high school guidance counsellor would advise. I went from the attorney general’s office to motor vehicles, then jumping over to the State Department. One of the things you become adept at is dealing with leaders, I’ve dealt with the president, the vice president, the secretary of state, world leaders when they would come to visit, everyone from the Queen of England to Vladimir Putin, I’ve either briefed them or had to interact with them. Basically, be professional and be prepared. As far as accomplishments go, I was commissioner of motor vehicles in New York before and after 9/11. Proving the security of the license document and the process for issuing the licenses is number one. And number two, improving the customer experience in both of those states. One of the other accomplishments I’m proud of, I feel that I’ve left the organizations I’ve worked with in a better position than when I came in. It’s all incremental. My former colleagues are all friends, that’s an accomplishment. You want people to say of you, this is a good, honest public servant. You may not have solved all the problems of the world or done all the things you wanted to do, but you move the ball forward and in the right direction. How do you inspire your staff? 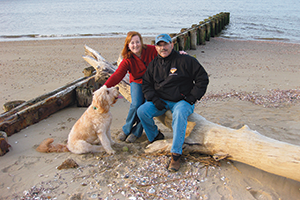 Administrator Martinez enjoys visiting the beach near his home with his wife, Marin, and his Goldendoodle, Finley. As commissioner in both New York and New Jersey, I made it a point to go out and visit with the frontline personnel and break down that distance that often occurs between headquarters and the frontline field personnel. That can happen in any business. The folks on the frontline can sometimes feel a great distance from leadership and may not understand how or why decisions are made by headquarters. When you show up and walk around the counter and give your people time to hear them, a lot of people don’t want to give the boss bad news, but if you just stay in your office, the bad news may not get to you. Sometimes you have to prod and coax them, but the people on the frontline will tell you what the challenges are and what they’re hearing from customers. You have to force yourself, as a leader, don’t be shy, go out there and make sure they feel comfortable talking to you. It’s the same thing here at FMCSA, we have 1,100 people on staff, with offices in every state. I’m on phone calls every day, I visit offices, trying to make sure there is not a disconnect between headquarters and the field. I also said my first day in the office here to the executive staff, my first order of business is bad news first. Don’t bury it, don’t sweep it under the rug, it will eventually come to light, and by then it will be worse. Communicate and treat each other in a collegial manner. You’ve got to work at that, but it pays dividends. What transportation-related issues are you most passionate about? The roads are dangerous out there, everyone knows it. You don’t have to be out there long to see bad behavior on the roads—aggressive driving, speeding, impaired driving, distracted driving—I think distracted driving right now is an epidemic. These are behaviors that cause so many unnecessary deaths on our roadways. I’m a firm believer in the Road to Zero Initiative. We all have to work together to achieve that. The three Es in transportation have never failed me: Education, Enforcement, Engineering. Those are the keys to improving transportation safety. On the engineering side, I would include the automation of vehicles and the possibility of fully automated vehicles on the road, not just passenger but commercial vehicles as well. The human driver is a huge causal factor in most crashes on the roadways. I’m hoping continued advancement of automated assist will help in that regard. When trucks or buses are involved in crashes, there is a higher likelihood of injuries or fatalities because of the physics, but also these vehicles are often carrying more people. I get reports any time there is a serious crash in the country. It’s scary, you never know when or where it’s going to happen. We all go down the roadway assuming you’re going to get home safely, but you never know. I always hope the decisions we make in the motor carrier world improve safety and don’t detract from it. That we are doing the right thing. Sometimes you don’t know until six months, a year, two years down the road if the things you’ve done actually work and help. What do you enjoy doing in your free time (assuming you have any)? I like to spend time with my wife Marin and my dog Finley. Finley and I walk on the beach, she loves to chase tennis balls, it relaxes me to go out on the beach and play ball with her. Every once in a while, Finley will let me fish when we’re on the beach, but I leave it up to her. My wife gets what I do, she understands and supports me. She knows I love public service. You’ve got to have complete buy-in from your partner to do a job like this, especially with all the travel. Are there any other comments or advice you’d like to share with the AAMVA community? Get involved. AAMVA is a great way to exchange ideas and to know that other jurisdictions are going through the same things you are. IT is always a big challenge, I’ve worked on more IT projects in the last 20 years than I can tell you, but that’s one of the biggest challenges we all face, it comes with the furniture. If you can improve your IT infrastructure, that will help you deliver better service to your customers and stakeholders. And one of the ways to do that is by being very active in AAMVA. I’m also very pleased that in this job, though I’m wearing a different hat, I still get to be active with AAMVA. For however long I’m in this position, I will remain part of the AAMVA community. 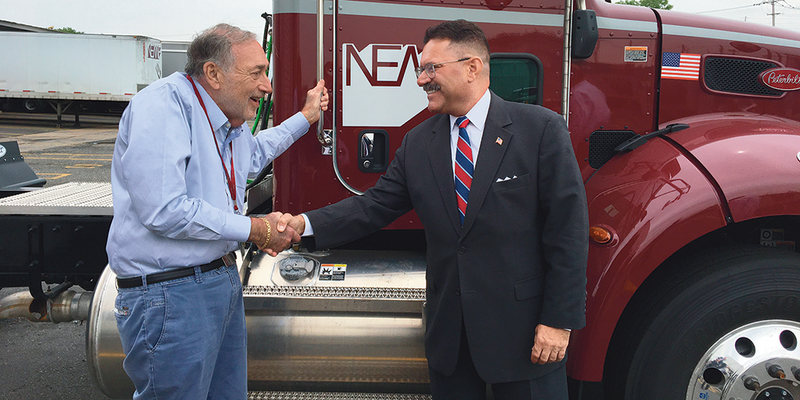 Featured image: Administrator Martinez greets New England Motor Freight Chairman Myron “Mike” Shevell after a meeting on trucking industry issues.